Many people want to know what the Bible has to say about God and other pressing issues. To meet that need Derek Prime has provided a helpful guide that anyone can use. If you have ever wondered what the Bible really says about something then this is where to start.The book is in 2 parts. The first part deals with the 50 bible questions and answers. The second part is headed Bible Guidelines, and has 5 further helpful sections: The Ten Commandments Subjects arising, directly or indirectly from the 10 commandments The desires and works of the sinful nature Christian Character (The fruit of the Spirit) Commitment to the Lord Jesus Christ and the gospel. 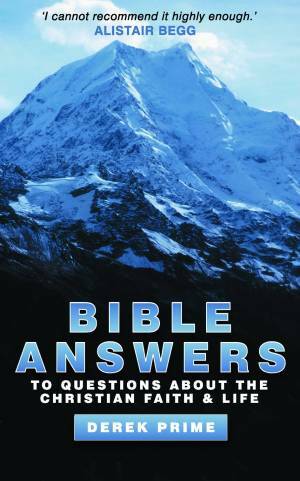 Bible Answers by Derek Prime was published by Christian Focus Publications in February 2007 and is our 17931st best seller. The ISBN for Bible Answers is 9781857929348. Be the first to review Bible Answers! Got a question? No problem! Just click here to ask us about Bible Answers.